Lift curses with the kiss of love and restore the happily-ever-afters. "I love this game! It's challenging and also satisfying when you free a frog. Great graphics and storyline. Best of all, there's help right there when you need it." Once upon a time, an evil witch grew tired of the darkness and jealousy that festered in her bitter soul. Unbetrothed and desiring to wed a prince, the witch grew more envious by the day of the beautiful princesses to whom all the princes were engaged. One day, the witch vowed that all who rejected her affections should be turned into frogs, and she cast a spell that transformed all the princes in the land. 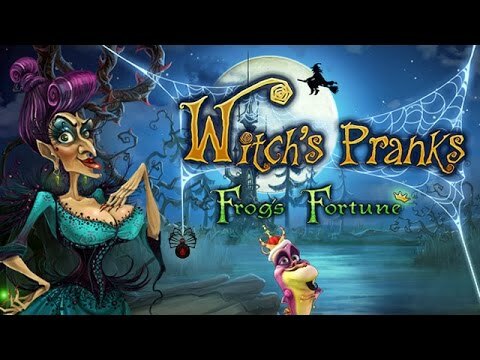 Return the bewitched to their brides, cure the spell with the kiss of love and restore the happily-ever-afters to your most beloved fairy tales in Witch's Pranks: Frog's Fortune. Very cute and fun! The graphics are really good and the music and sound effects make the game enjoyable. I really enjoyed this game. I found it very hard to walk away and finished it in two sittings. I would thoroughly recommend it. Witch's Pranks is a nice game. It took a while to catch on but I enjoy playing it.